With Halo 4's Castle Map Pack now available, Microsoft wants to offer you a bit of incentive to grab the rest of the game's extra content - but you'll need to hurry to grab it all. 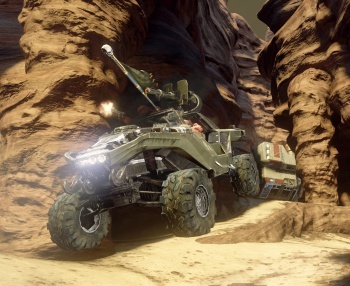 The Castle Map Pack for Halo 4 debuted this week. That would be news in an of itself, but in an effort to pull in even more extra cash from Halo fans, Microsoft has opted to discount all previous DLC releases for the game. The big caveat here? This sale runs for one day only. Either you buy these packs at a discount today, or you're stuck paying full retail price tomorrow. So, what kind of discounts are we looking at? According to Microsoft, both the Crimson Map Pack and the Majestic Map Pack are each now now available for $7.50 (instead of their usual $10 price tag). Likewise, the War Games Map Pass has been discounted from $25 to a more wallet-friendly $20. You can find all of these discounts on the Xbox Live Marketplace, but again, they're only valid for today, so if you're interested we'd recommend you hurry over and grab your discounted content ASAP. Oh, and in case you're wondering, the Castle Map Pack will set you back $10. It's too early for this addition to see a discount, though buying the discounted War Games Map Pass will allow you to grab all three DLC packs for what is effectively two-thirds of their normal pricing. If you've got the scratch and don't already own any of the DLC packs, that's definitely the way to go.